Satoru's childhood friend, Haruka, introduces him to the Card Hero card battle game. Help Satoru work his way through the tournaments and become the Card Hero master. Build a deck and use your Monsters to protect your Master Card as you take out the opponent Master. 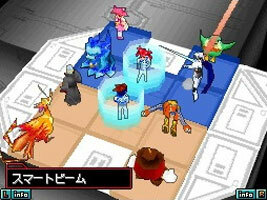 The matches are played with new Speed Battle rules, where the first player to take out five monsters is declared the winner. Winning matches earns you money, which you can spend on new cards at Maruo Maruhige's store.